Excess Winter Deaths claimed an estimated 24,000 lives in England and Wales in 2011/12 and, although we do not fully understand all the reasons behind these figures, we know that some of them are caused by people living in cold homes. Recent research by the Department of Climate Change has started to quantify the health benefits of installing energy efficiency measures in improving thermal comfort of homes. In a resource stretched environment unfortunately health issues often come down to basic cost/benefit analysis – and for that you require research and figures. 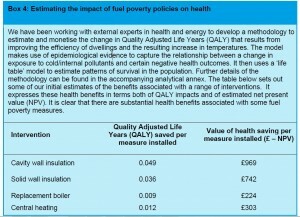 However initial research is very positive for energy efficiency measures impact on health. DECCs research has suggest that installing Cavity wall insulation has a financial benefit of £969 NPV (net present value) which, considering the average cost of this measure is generally about £500, indicates a good investment overall. Therefore saving money for public services which are providing healthcare. Also an interesting new term for the author is ‘quality-adjusted life years’ – which is a measure used and defined by NICE (National Institute for Health and Care Excellence) for assessing the benefits from new drugs. Essentially if a drug costs more than £20,000-£30,000 (which is apparently the quantified benefit of a ‘quality-adjusted life year) then it is not likely to be issued. 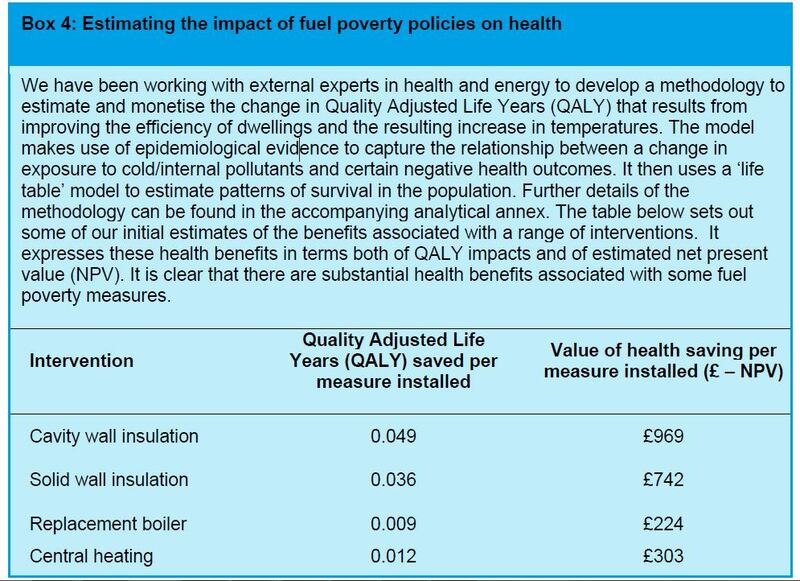 Whatever your views on these kind of measurements – with the movement of Public Health into Local Authorities there is potentially more scope to work with this agenda in promoting and undertaking energy efficiency measures to improve health outcomes. Perhaps in the future we can all be asking our GP’s for prescriptions for loft insulation? Benefiting the planet as well as our own health and addressing a terrible statistic still occurring in our nation. Energy efficiency saves you your health!